This post almost didn’t happen because we ate practically all of the subject matter before realizing the container was nearly empty! “Addictive” might be an overstatement of the attraction power of certain foods, but sometimes you just have to go with it. This is one of those times. 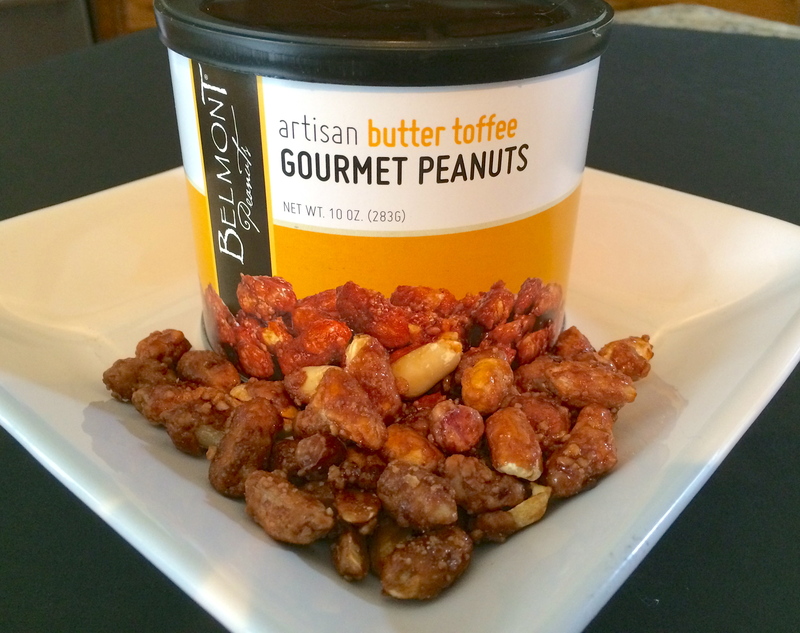 Allen is the peanut lover at our house and when I brought home this can of Belmont Artisan Butter Toffee Gourmet Peanuts, I expected he would enjoy them solo. Wrong. I opened the can, tasted a couple of the toffee-covered peanuts and fell in love with their rich, buttery crunch. Belmont Peanuts come from the Virginia family farm owned by Bob and Patsy Marks. Bob and his brother, Mike, are farmers who grow peanuts, cotton, soybeans, corn, and watermelons in the heart of Virginia peanut country. Patsy grew up on her father’s peanut farm, so these folks know peanuts. In 1993, Bob and Patsy decided to share their quality peanuts through a mail-order business started in the basement of their home. Patsy worked the business around the farm’s schedule and being a full-time mom. Their children were pressed into service to help maintain the crops when things got really busy, and son, Robert, is still active in the operation. In 2004, David Peck joined the Marks family business, bringing peanut cooking skills he began learning as a very small boy. Demand for the family’s products quickly required more space, and a move was made from the basement to a larger facility on the farm. These peanuts are so awesome in part because of the Marks family’s environmentally sound farming practices. They also use the same small-batch cooking methods David learned as a child. If a hand-cooked batch doesn’t turn out just right, it goes in the trash. Under the watchful eyes of Bob, Patsy, Robert, and David, quality is absolutely under control from the peanut field to your snack bowl! Belmont offers a variety of flavors, which you can order direct from the farm.